Another year another playlist. This marks the FIFTH ... FIF! annual playlist for me. This year alot of regulars came back to make it easy for me, The National, Arctic Monkeys, Araabmuzik, Franz Ferdinand ect. This year there seems to be a huge movement/push for female artists. A few songs on this list highlight some female artists who aren't painted into the folk/indie corner ... I'm actually seeing a nice lean towards trip-hop again. Portishead now influencing a nice swatch of young artists making some beautifully haunting music. I'm also seeing the biggest dip in the Indie music scene with every band trying to "out-Indie" eachother. It seems like 50% are trying to make their band as 90's and retro as possible the other 40% are copying Pet Sounds and the smallest slice are actually pushing the genre forward. As with most things, everything ebbs and flows and in a few years it will come back. In EDM, Dubstep has given way to Trap already and old style trance is being popularized with Avicci. Say what you want it's a genre which I love and it gets stale very easy. It's nice to see a whole new generation appreciate the positive vibes of trance music again as I think the first pass gave birth to Big Beat in the late 90's and fizzled out quickly. My biggest surprise has been Nine Inch Nails this year with might be the comeback of the year. A former angst-laden teen who lived and died by NIN has easily felt betrayed by the recent decade plus of sub-par misguided music even disbanding NIN to put out some garbage with his wife. This album is back to being innovative, fresh, while keeping the signature sound we have been used to for almost 25 years. The National just can't write a bad song anymore and following up with my cherished High Violet, Trouble Will Find Me is an equal masterpiece of brooding and introspection. There are a few new faces in this list like Ghost, Run the Jewels, and Radkey, all with excellent releases this year. I hope you enjoy the list as much as I love making it. If there is ever a desrire to download any or all of this list just contact me Construx Paul and I'll make sure it happens. 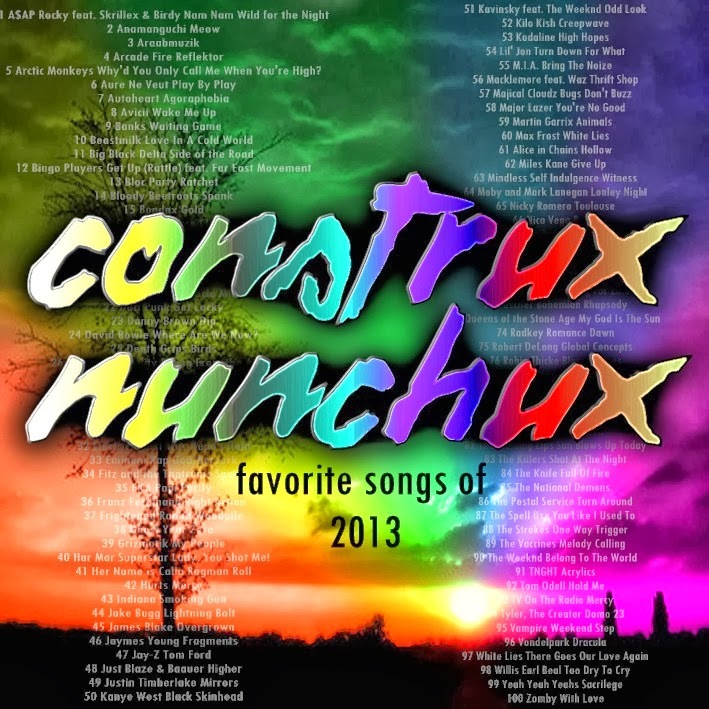 construXnunchuX.com Favorite Songs of 2013 from construxnunchux on 8tracks Radio. 5 Arctic Monkeys - Why'd You Only Call Me When You're High? 24 David Bowie - Where Are We Now? 40 Har Mar Superstar - Lady, You Shot Me!